07.05.2014 : TRB PGT Other Subjects Results on or after June 2014. TRB has already published the results for the PGT Tamil exam. But the results of all other subjects are being held by the TRB due to cases in the Madras High Court. As the high court is on holiday, next hearing will be in the June month. So TRB may release the final result for other subject candidates in the June month of 2014. 20.12.2013 : The High Court has permitted the TRB to publish the PGT Tamil Exam 2013 Results. The results of the Tamil PG TRB Exam is expected to be published today or tomorrow. TRB has released new updated list of 213 selected candidates. The PG TRB Exam Results published on 07.10.2013. Will TRB conduct a Re-exam for TRB PG Teachers Recruitment Tamil Subject ? Out of 31,983 candidates who wrote the PGT Tamil Exam for 605 Tamil PGT vacancies on21.07.2013, 8,002 students were given question papers with about 47 questions spelling mistakes and errors. Madurai High Court has asked explanation from the Teachers Recruitment Board about 'whether there will be a re examination for PGT Tamil candidates ? " and also suggested the government of Tamilnadu to consider about conducting re examination for the Tamil Subject Candidates. TRB has announced the answer key for the following subjects in the Tamilnadu Teachers Eligibility Exam, TRB Website www.trb.tn.nic.in. 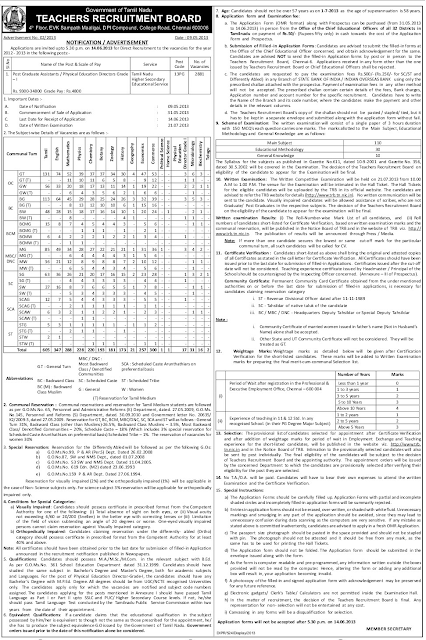 TRB PGT Teachers Recruitment 2013 Applications Issue Date is 31.05.2013 May 31st . Applications will be issued till June 14th. Last date for issue of application is 14.06.2013. Where to get Application for TRB PGT exam 2013 ? Applications will be available in all 32 District Education Officer ( DEO Office ) Offices. Examination fee of TRB PGT exam 2013 ? Where to Submit TRB PGT Exam 2013 Applications ? The filled applications should be submitted to the respective Chief Education Officer (CEO Office ) Office on or before June 14th 2013 before 5.30pm. 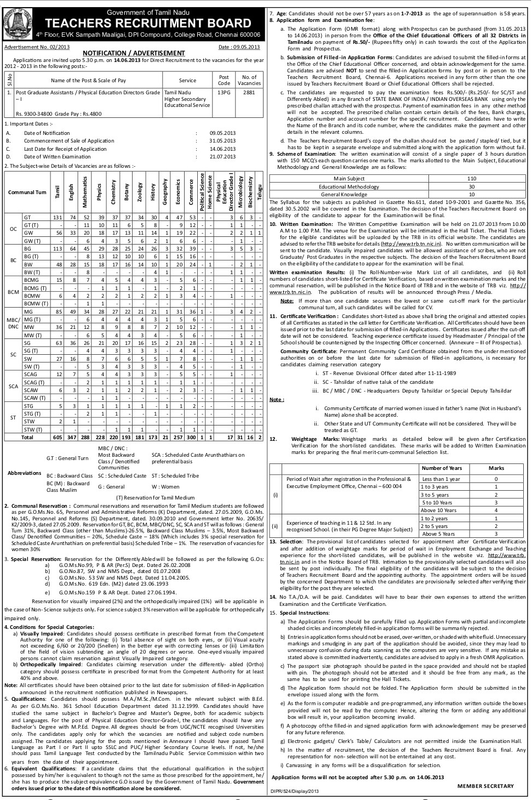 Today 09.05.2013 Tamilnadu teachers recruitment board TRB has announced recruitment for 2881 post graduate teachers or PG assistants for government higher secondary schools in Tamilnadu.